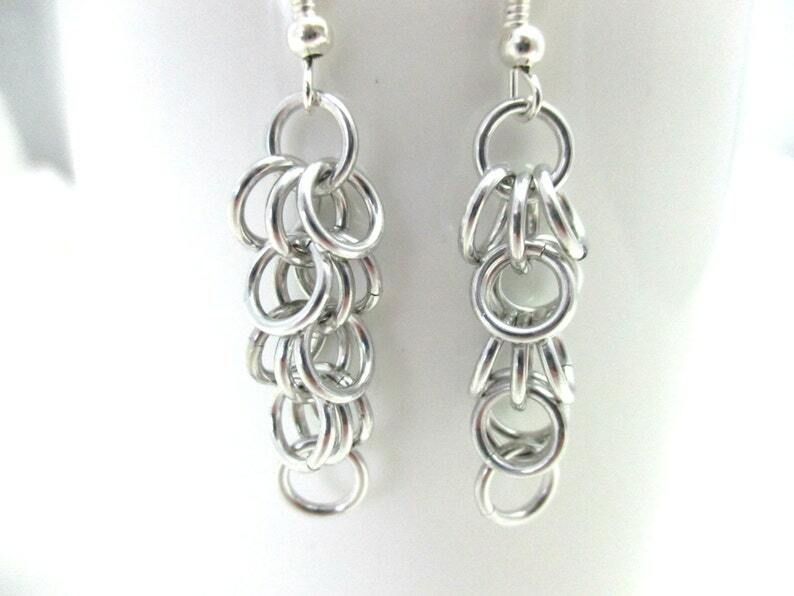 These long, dangly chainmail earrings, were woven with Bright Silver anodized aluminum jump rings. These earrings are lightweight, and comfortable to wear. Great for everyday or that special night on the town. They are suspended from a pair of white brass earring wires. Tiny Red Scale Flower Earrings - Scalemaille Earrings - Ready to Ship! Tiny Purple Scale Flower Earrings - Scalemaille Earrings - Ready to Ship! Tiny Frost White Scale Flower Earrings - Scalemaille Earrings - Ready to Ship! Tiny Gold Scale Maille Earrings - Shaggy Leaves Scale Mail Earrings - Ready to Ship! Tiny Shiny Gold Scale Flower Earrings - Scalemaille Earrings - Ready to Ship! Tiny Black Scale Flower Earrings - Scalemaille Earrings - Ready to Ship!